Indian communications satellite. Experimental communications satellite. Communication / Meteorology satellite built by Ford Aerospace for Insat, India. Launched 1982 - 1990. 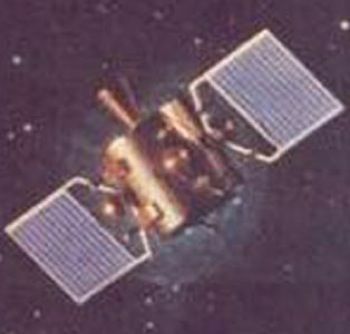 Used Insat-1 Bus. AKA: Apple. Status: Operational 1981. First Launch: 1981-06-19. Last Launch: 1990-06-12. Number: 5 . Gross mass: 1,170 kg (2,570 lb). Family: Communications, Geosynchronous orbit. Country: India. Engines: R-4D. Launch Vehicles: Thor, Delta, Space Shuttle, Ariane 1, Ariane, Ariane 2/3, Delta 3910/PAM, Ariane 3, Delta 4000, Delta 4925-8, Delta 3000. Projects: Insat. Launch Sites: Cape Canaveral, Cape Canaveral LC17B, Cape Canaveral LC17A, Cape Canaveral LC39A, Kourou, Kourou ELA1. Agency: ISRO. Bibliography: 2, 279, 6, 12655. Apple - . Mass: 1,170 kg (2,570 lb). Nation: India. Agency: ISRO. Program: Insat. Class: Communications. Type: Civilian communications satellite. Spacecraft: Insat 1. Completed Operations Date: 1983-09-20 . USAF Sat Cat: 12545 . COSPAR: 1981-057B. Apogee: 35,945 km (22,335 mi). Perigee: 35,752 km (22,215 mi). Inclination: 10.00 deg. Period: 1,439.30 min. Experimental communications satellite. Geosynchronous altitude, longitude 10 deg East. Positioned in geosynchronous orbit at 102 deg E in 1981-1982 As of 31 August 2001 located at 42.73 deg W drifting at 0.834 deg W per day. As of 2007 Mar 10 located at 39.31E drifting at 0.875W degrees per day. 1982 April 10 - . 06:47 GMT - . Launch Site: Cape Canaveral. Launch Complex: Cape Canaveral LC17A. LV Family: Thor. Launch Vehicle: Delta 3910/PAM. Insat 1A - . Mass: 1,152 kg (2,539 lb). Nation: India. Agency: ISRO. Program: Insat. Class: Communications. Type: Civilian communications satellite. Spacecraft: Insat 1. Completed Operations Date: 1982-09-04 . USAF Sat Cat: 13129 . COSPAR: 1982-031A. Apogee: 35,829 km (22,263 mi). Perigee: 35,734 km (22,204 mi). Inclination: 13.30 deg. Period: 1,435.80 min. Also carried transponders for domestic communications. Operational multipurpose satellite for telecommunications, meteorological, imaging and data relay, radio and television programme distribution and direct television broadcasting for community reception. Geosynchronous orbit longitude 74 E. A/AC.105/INF.391 was reissued as ST/SG/SER.E/79. Also registered by the United States as 1982-31A in ST/SG/SER.E/67, with category C and orbital parameters 1416.7 min, 35032 x 35783 km x 0.5 deg. Positioned in geosynchronous orbit at 73 deg E in 1982 As of 29 August 2001 located at 82.99 deg E drifting at 0.337 deg W per day. As of 2007 Mar 10 located at 39.55E drifting at 0.205W degrees per day. Insat 1B - . Mass: 1,152 kg (2,539 lb). Nation: India. Agency: ISRO. Program: Insat. Class: Communications. Type: Civilian communications satellite. Spacecraft: Insat 1. Completed Operations Date: 1993-08-03 . USAF Sat Cat: 14318 . COSPAR: 1983-089B. Apogee: 35,824 km (22,259 mi). Perigee: 35,811 km (22,251 mi). Inclination: 3.60 deg. Period: 1,437.70 min. Released from STS 8 8/31/83; also carried transponders for domestic communications. Operational multipurpose satellite for telecommunications, meteorological imaging and data relay, radio and television programme distribution and direct television broadcasting for community reception. 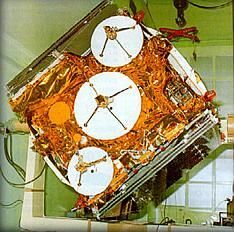 Geostationary longitude 74.0 +/ - 0.1 deg E. Deployment from US Space Transportation System flight no 8, orbiter Challenger, on 31 Aug 1983. Positioned in geosynchronous orbit at 74 deg E in 1983-1992; 93 deg E in 1992-1993 As of 26 August 2001 located at 125.27 deg E drifting at 0.152 deg E per day. As of 2007 Mar 10 located at 80.35E drifting at 0.392E degrees per day. 1988 July 21 - . 23:12 GMT - . Launch Site: Kourou. Launch Complex: Kourou ELA1. LV Family: Ariane. Launch Vehicle: Ariane 3. Insat 1C - . Mass: 1,190 kg (2,620 lb). Nation: India. Agency: ISRO. Program: Insat. Class: Communications. Type: Civilian communications satellite. Spacecraft: Insat 1. Completed Operations Date: 1989-12-01 . USAF Sat Cat: 19330 . COSPAR: 1988-063A. Apogee: 35,814 km (22,253 mi). Perigee: 35,755 km (22,217 mi). Inclination: 9.00 deg. Period: 1,436.00 min. Stationed at 93.5 deg E; also performed communications tasks. Operational multipurpose satellite for telecommunications, meteorological imaging and data relay, radio and television programme distribution and direct television broadcasting for community reception. Geosynchronous orbit longitude 93.5 +/- 0.1 deg east. Launch vehicle Ariane 3 launch vehicle of Arianespace, 24th flight of Ariane and 9th flight of the Ariane 3 version. Positioned in geosynchronous orbit at 93 deg E in 1988-1989 As of 4 September 2001 located at 58.51 deg E drifting at 0.073 deg E per day. As of 2007 Mar 11 located at 80.89E drifting at 0.154W degrees per day. 1990 June 12 - . 05:52 GMT - . Launch Site: Cape Canaveral. Launch Complex: Cape Canaveral LC17B. LV Family: Thor. Launch Vehicle: Delta 4925-8. Insat 1D - . Mass: 1,190 kg (2,620 lb). Nation: India. Agency: ISRO. Program: Insat. Class: Communications. Type: Civilian communications satellite. Spacecraft: Insat 1. USAF Sat Cat: 20643 . COSPAR: 1990-051A. Apogee: 35,851 km (22,276 mi). Perigee: 35,729 km (22,200 mi). Inclination: 3.70 deg. Period: 1,436.30 min. 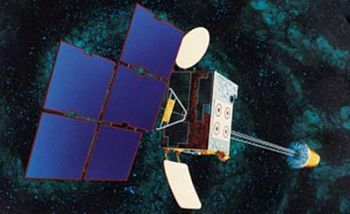 Also performed Indian domestic communications tasks; 83.1 E. Operational multi-purpose satellite for telecommunications, meteorological imaging and data relay, radio and television programme distribution and direct television broadcasting for community reception. Orbital position 83 deg E. Also registered as 1990-5 1A in ST/SG/SER.E/250 by the United States, with category B and orbital parameters 1426.3 min, 35768 x 35811 km x 0.2 deg. Positioned in geosynchronous orbit at 83 deg E in 1990-1999; 74 deg E in 1999-2000 As of 5 September 2001 located at 73.85 deg E drifting at 0.000 deg E per day. As of 2007 Mar 10 located at 71.63E drifting at 0.039E degrees per day.